Located in the heart of Manhattan, New York, this iconic Art Deco office tower built in 1931 is a must see on your trip to NYC. The observation decks on the 86th and 102nd floors provide you with unforgettable 360 views of New York City. With a two story building model, Art Deco ceiling murals and Dare to Dream Exhibit the Empire State Building is an immersive experience both inside and out. Open 365 days a year from 8am-2am. Incentra Village Hotel is a mere 14 mins away from the Empire State Building! In honor and memory of those who died in the September 11, 2001 World Trade Center terrorist attacks , are two beautiful reflecting pools each nearly an acre in size resting in the footprints of where the Two Towers once stood on Ground Zero. The recessed reflecting pools feature the largest man-made waterfalls in North America, and are an area of contemplation, remembrance, and honor. This National Memorial is located only 14 mins from Incentra Village Hotel. Located in the heart of New York City, Central Park is home to more than 42 million visitors each year! With 843 acres, this oasis provides a breath of fresh air and relaxation to the bustle and noise of the city. After an era of decline in the 1960s and 1970s the Central Park Conservancy was created to restore the park to it's beautiful state and make it once again a place of beauty and safety for all who come to visit. The Statue of Liberty was given as a gift of friendship from the people of France in 1886. Standing as a beacon of light and hope, Lady Liberty holds her torch high, welcoming all to the Land of the Free and Home of the Brave. The Statue of Liberty has stood as a symbol for America during times of war and peace, and has taken on different symbolic meanings over the years for a variety of groups. Lady Liberty is located 22 mins away from Incentra Village Hotel. Originally known as Long Acre Square after London's carriage district, the square began as a horse exchange area. In the early 1900's Long Acre Square was renamed to Times Square and has become the heart of New York City's entertainment, Broadway Musicals, advertising, business and more! Located between Broadway and Seventh Avenue and 42nd and 43rd Streets. The Metropolitan Museum of Art is one of the world's greatest collections of art with over 5,000 years of history from ancient to modern and contemporary. The Met is a grand building that features programs for kids and families, teens, adults, university students and faculty, educators, and visitors with disabilities. Come visit one of the grandest museums in New York City. Ripley's Believe It or Not is a historic Times Square Museum and home to over 500 rare artifacts and interactive exhibits. Some of the items featured were discovered and owned by Robert Ripley himself! Immerse yourself in the unusual, the unexpected, and the unbelievable in one of New York City's most incredible interactive museums. The Brooklyn Botanic Garden was founded in 1910 in a time when New York City was quickly being developed into a cityscape of buildings. The garden serves as an urban oasis to those in the city, and is now known as one of the best botanical gardens in urban gardening and horticultural displays. This towering New York City Neo-Gothic church was built from 1858 - 1879 and welcomes it's doors to more than 5 million people every year from all walks of life. It's history links generations together through it's construction and worship. Feel the awe and reverence as you enter this magnificent structure. This observatory on top of the Rockefeller Center is sure to give you chills as you view the sweeping views of Central Park and Manhattan's midtown and downtown skyscrapers. Get a New York City Pass to experience six top attractions and save 42%. In 1943 Frank Lloyd Wright was commissioned by the Solomon R. Guggenheim Foundation to create a temple of spirit. The Guggenheim Museum stands as a monument to modernism and is one of the most significant icons of the 20th Century. Visitors can experience impressive collections and special exhibitions on modern and contemporary art featured throughout the great spiral rotunda. Explore the world and universe in one of the most famous natural history museums in the world! Experience a space show in the Hayden Planetarium, dinosaurs more than 120 feet long, creatures of the deep including a 94 foot long blue whale, exhibits on animals from around the world and more! 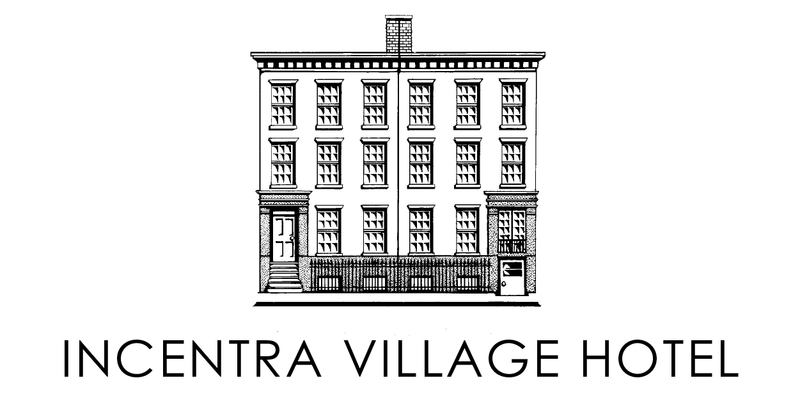 Incentra Village Hotel is located at 32 Eighth Avenue between West 12th and Jane Streets, just above Abingdon Square. One of our major advantages is our location in the West Village, a pleasant and attractive residential neighborhood and the traditional center of gay life in New York City. With much of the area land-marked for historic preservation, the quaint atmosphere is of the early nineteenth century. Many streets are narrow and tree-lined and most houses are small with front gardens, ornamental ironwork and intimate private courts, which gives the area its distinctive charm. We recommend a yellow taxi in from airports or car service (call ahead) for in and out to airports. The closest Subway Station is at Eighth Avenue and 14th Street and the blue line subways A, C, and E trains. There is on-street parking available, however, we recommend two nearby Parking Garages. We also recommend two NYC Tours. Chelsea, just a few blocks uptown from Incentra and widely considered the new heart of gay New York City, enjoys a mix of attractions similar to the Village: shops and restaurants of all kinds; blocks of attractive brownstones and historic institutions; bars, taverns, clubs, and major retail districts. You'll find a liquor store, laundromat, dry cleaner, bike rental, and barber shop all within a few blocks of Incentra. The Meatpacking District, a 24-hour neighborhood just a few blocks to the West of Incentra, offers trendy new restaurants, cafes, clubs, and art galleries. An area that has retained its character with historic architecture and cobble stone streets, designers, architects and creative industry headquarters have moved in along meatpacking plants, creating a destination known for cutting edge fashion, design, food, and culture. The Meatpacking District is anticipating the development of Pier 57, located at the end of West 15th Street, as an urban marketplace scheduled for 2014, and the arrival of the Whitney Museum opened in May, 2015. The High Line, where visitors get to walk in the "park in the sky" was been developed from the abandoned elevated freight train tracks of the 1930's, and runs from Gansevoort Street, through the Meatpacking District, to West 20th Street. This quintessential New York City landscape has recently opened Phase 2, running to West 30th Street. The Hudson River Park, stretching five miles from Battery Park in Lower Manhattan to 59th St, is the largest park created in Manhattan since Central Park. The Park incorporates many renovated piers on the Hudson River providing sports fields, waterfront access, landscaped lawns and is a favorite spot for kayakers, rollerbladers, runners and cyclists. Throughout the park, visitors enjoy panoramic views that include the Statue of Liberty, Ellis Island, the Hudson River, and the New Jersey skyline.